Lawmakers in the state of Indiana have agreed on new language for a controversial “religious freedom” law that aims to ensure businesses there can’t discriminate against customers amid a nationwide backlash. State Senate President Pro Tem David Long (R-Fort Wayne) unveiled the proposed change on Thursday morning and said it will "unequivocally state that Indiana's (religious freedom) law does not and will not be able to discriminate against anyone, anywhere at any time,” according to USA Today. 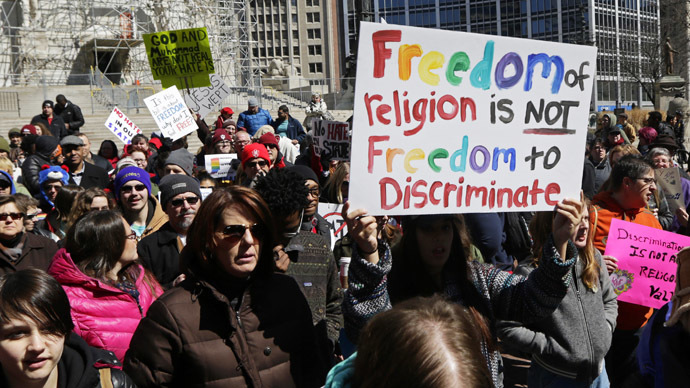 Lawmakers in the Hoosier State rushed to come up with a fix for RFRA after a firestorm erupted following the decision last week by Governor Mike Pence, a Republican, to sign the bill into law. Critics of the act, including the Obama administration, said it would unfairly allow businesses in Indiana to discriminate patrons based on sexual orientation or gender identity, giving proprietors the power to shun the lesbian, gay, bisexual and transgender community under the guise of religious protection. “The law in Indiana applies to private transactions as well and that's why we've seen such a bipartisan political outcry against the law,” White House press secretary Josh Earnest told reporters on Tuesday, adding the administration believes RFRA “flies in the face of the kind of values that people across the country strongly support." "What was intended as a message of inclusion was interpreted as a message of exclusion, especially for the LGBT community," Indiana House Speaker Brian Bosma told reporters at news conference on Thursday morning when the proposal was rolled out, according to ABC News. "Nothing could have been further from the truth, but it was clear the perception had to be addressed." Governor Pence said on Tuesday he had found it “offensive” that the public has interpreted the religious freedom law as a means of legalizing discrimination and urged politicians to draft a fix. "I don't believe for a minute that it was the intention of the General Assembly to create a license to discriminate, or a right to deny services to gays, lesbians or anyone else in this state. And it certainly wasn't my intent," Pence said. "But I can appreciate that that's become the impression, not just here in Indiana, but all across this country. And we need to confront that." Without the proposed fix, RFRA as it presently stands allows businesses operating in Indiana to justify religious obligations in refusing services to customers. Part of the suggested fix, however, says services cannot be refused based on sexual orientation or gender identity, and clarifies that businesses can’t “establish a defense to a civil action or criminal prosecutions for refusal by a provider to offer or provider a service” on the basis of those factors. Lawmakers are expected to meet later on Thursday and vote on the proposal.